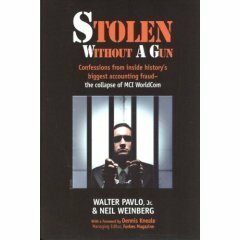 Business Books: Stolen Without a Gun by Walter Pavlo Jr.
My copy of Stolen Without a Gun by Walter Pavlo and Neil Weinberg just arrived the day before, and so far I have only read half of it. However, it's a superb read so far and only getting better with each chapter. I enjoy non-fiction accounts of corporate crime and rogues for the same reasons that I enjoy good caper flicks. These books are also worth reading because they give entrepreneurs a better understanding of what's really going on inside the large fast growth companies that they may be trying to do business with. For example, there's often a never-ending war between the sales-people who are only interested in commissions and the finance department which tries to adhere to set standards regarding who can and cannot be accepted as a customer. When push comes to shove, the sales department wins more times than it loses. In other words, push hard enough if you're trying to become a reseller of a large fast growth company's products and you will most likely be accepted despite not meeting any of the official criteria. This should come as no surprise considering just how much pressure these companies are under to maintain sales growth and the resultant rising share prices. Now don't misunderstand me, in no way am I suggesting that all fast growth corporations are rife with criminal behavior. Not at all. However, the tremendous pressure to "hit the numbers" each and every quarter can lead to a massaging of books as well as a propensity to make certain types of business decisions. Once an entrepreneur understands these pressures, his approach to larger organizations changes dramatically and this usually leads to better results. Once more, to be crystal clear here, an honest entrepreneur intent on doing honest business with a large fast growth company can still benefit from this knowledge. In the politically incorrect Billionaire Strategies Course we explore the types of decisions that this pressure often leads to and how they can be capitalized on in an honest and legal fashion by entrepreneurs. It's beneficial to understand these pressures if only for purely defensive reasons. Now that Mr Pavlo has paid his debt off to society and published this book along with co-author Neil Weinberg, a senior editor at Forbes, he has become an in demand speaker on white collar crime. You can find information on him at Etika LLC. One final comment: this book deserves to be made into a film. Hollowood are you listening? I have been recommending this book for a year or so now to people involved with Internet startups. It's a great little generalist book on what it takes to launch a company these days. It really helps in getting you pumped up for the challenge if you're feeling a bit overwhelmed by everything that needs to be done. Wil now offers the book as a free download from his website. Just click here to get your instant free copy of Go Big or Go Home. The fastest growth is through acquisitions. Learn how to start and manage an M&A campaign.